The Real Estate Cafe's "Booth Sleuth" is eager to attend the leading real estate technology conference in New York this week so we can identify the latest tools and trends to help clients save money. 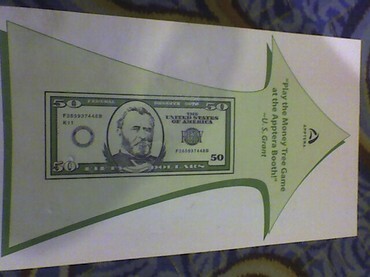 To raise funds, we're repeating the "fare sale" we offered in November 2007. If you think you'll be using our services anytime in 2008, we encourage you to prepay for them now so you can enjoy savings of up to 50%. More details upon request. If you're looking to develop a new product or service to help real estate consumers save time and / or money, we're also willing to conduct sponsored research at the conference. For examples of our work, see Twitter posts and "Live Notes" from last real estate conference on The Real Estate Cafe's public wiki. Confidential inventory of Web 2.0 applications in real estate also available. What's in a [real estate blog] name? The excerpt below was sent to a fellow real estate blogger in San Francisco who wanted to know why The Real Estate Cafe named it's blog, "Counter Intelligence:"
"Over the past decade, we've used a handful of restaurant metaphors to communicate that we provide services to our clients "a la carte," and that we've encouraged our customers, clients, and any others to share their perspectives peer-to-peer to get a more insight into what's really happening in different segments of the real estate market in Greater Boston and beyond. Call it anything you like, we're delighted when anyone visits our site, and doubly delighted when they share their opinion in writing or by calling our reader line, 617-876-2117, and recording a brief sound bite [for our real estate podcasts]. Buyer agents' chatter revealing what's really going on behind housing stats? The Massachusetts Association of Realtors releases housing statistics for the second quarter of 2005 today. Since that's the strongest season of the year, it will mostly likely give home buyers the wrong impression about what really going on in the local housing market. For that, you need to listen to the chatter between real estate professionals, particularly buyer agents on their own password protected mail lists (something you can't do ;-). There, buyer agents in different areas have already begun asking their peers if they are also seeing a new phenomena in the market: houses selling for below their appraised value. That's right, not below their asking price, but below their appraised value. That either means that those lucky homebuyers just made money on their purchase (the difference between their purchase price and the appraised value of the property) because they were smart enough to use a REAL buyer agent, or that prices are already falling but that emerging trend has yet to appear in statistics. Time will tell if these are isolated incidents or not. In the meantime, put MAR's upcoming stats into seasonal context or a longer timeframe. Some argue the 2nd quarter statistics may reflect the top of the market, and years from now will be regarded as a turning point before the housing industry slid into a multi-year recession. "Despite the setbacks to Howard Dean’s first-of-a-kind Internet operation, the current discussion around the Blogosphere seems to be centered on when and where the next major impact point will be, and not whether the Internet will be an important player from this point on in the American political panorama. ...there is a sea change in the air, and some of the bulwarks of conventional control of the information stream are crumbling under the relatively free-form innovations from the digital frontier." 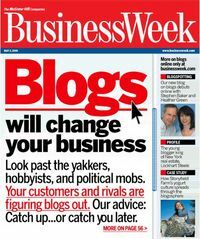 The February 2004 post continued, "This is where blogs might find an entry point in the real estate industry. As you know Ralph Nader and Steve Brobeck of the Consumer Federation of America both called the real estate industry a cartel more than a decade ago. One of my visions is a network of home buyers who post reviews of open houses and report on local market trends from the consumers' perspective. As the air comes out of the real estate bubble and the industry slides into a multi-year downcycle, home buyers will become increasing cautious and hungry for this kind of 'citizen journalism.'" Fifteen months later, it's no accident that one of the Business Week articles featured Curbed.com, the leading real estate blog in New York if not the nation, because "[it] dishes the dirt the brokers don't." Explaining the popularity of his blog, founder and former Massachusetts resident Lockhart Steele told BW, "People trust blog posts more because they sound like e-mails from a friend." Since it's founding in May 2004, Curbed.com's traffic has soared to over a million page view per month. Not sure if the article below entitled, "Breaking the Brokers," was published in Newsweek in April 2004, or on MSNBC in February 2005, when it was forwarded to me, or both. Regardless, the title reminds me of some heated debate at the Mass. 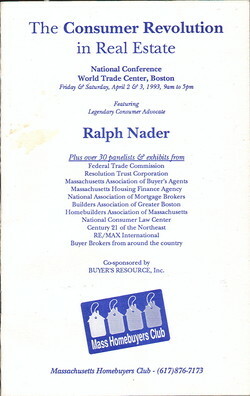 Homebuyers Club’s two-day conference at the World Trade Center twelve years ago, April 2-3, 1993. That event was called "The Consumer Revolution in Real Estate" and featured over 30 panelists from the public & private sectors (click on show program for partial list), plus keynote speakers Ralph Nader and Stephen Brobeck of the Consumer Federation of America. One of the most controversial panels was called "Breaking up the Real Estate Cartel" and it drew sharp comments from the then president of the Mass. Association of Realtors. Ironically, the executive director of the National association of Realtors did not deny being a cartel; instead, he told Business Week the Realtors were a "good cartel." More than a decade later, the mainstream press, Newsweek and MSNBC omitted reference to a cartel but clearly captured the resentment consumers have for bloated real estate commissions in this article.